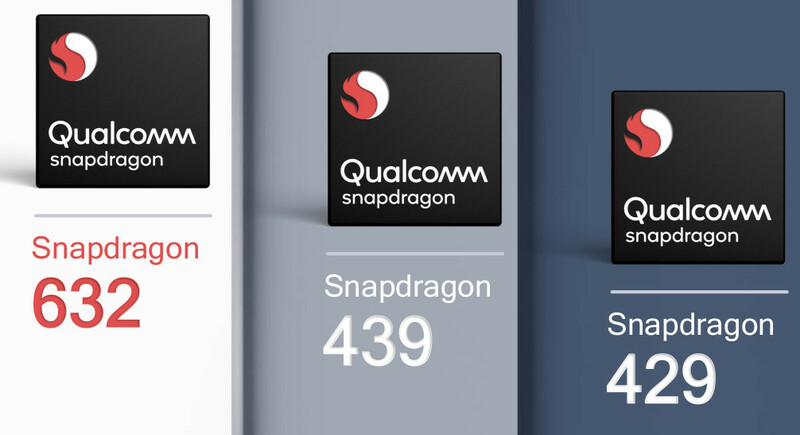 Qualcomm just announced the Snapdragon 632, 439 and 429 Mobile Platforms as new additions to Snapdragon 600 and 400 tiers. These promise better performance, better battery life, more efficient designs, impressive graphics and artificial intelligence (AI) capabilities, and are targeted at mid-range and budget devices. Compared to Cortex A53 CPUs on the Snapdragon 630, the Snapdragon 632 now uses Qualcomm’s custom Kryo 250 CPUs combined with X9 LTE modem. This promises 40% higher performance compared to Snapdragon 625/626. It is based on 14nm process technology. The Snapdragon 439 with Octa-Core Cortex A53 CPUs and Adreno 505 GPU promise 25% better performance, and 20% faster graphics rendering compared to Snapdragon 430, while the Snapdragon 429 with Quad-Core Cortex A53 CPUs and Adreno 504 GPU promise 25% better performance, and 50% faster graphics rendering compared to Snapdragon 425. These have artificial intelligence capabilities that enhance the camera, voice, and security experience. All these have Qualcomm Quick Charge technology, but the company has not revealed the version. The Snapdragon 632, 439 and 429 are software compatible, as well as with Snapdragon 626, 625 and 450. The Snapdragon 439 and 429 are pin- and software-compatible. Snapdragon 632, 439 and 429 powered devices are expected to launch in the second half of 2018.